Dr. Anubha Gupta graduated with Ph.D. degree in Electrical Engineering from IIT Delhi in 2006. She did her bachelor's and master's in ECE from Delhi University in 1991 and 1997, respectively. She started her professional career with the position of Assistant Director at ALL India Radio (through Indian Engineering Services) in 1993 and worked their until Feb. 1999. In Feb. 1999, she joined Netaji Subhas Institute of Technology (NSIT), Dwarka, Delhi. She worked as Assistant Professor in Computer Engineering Department at NSIT for eight years. From July 2011 to Dec. 2013, she worked as associate professor at IIIT Hyderabad. 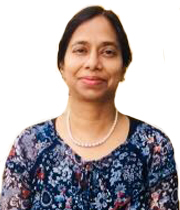 In Dec 2013, she joined IIIT Delhi as associate professor in ECE department. Apart from her engineering interests, Dr. Gupta is deeply interested in education policy issues. She did her second master's as a full time student from University of Maryland College Park, USA from 2008 to 2010. During this time, she worked as a project manager on a state policy related education project at the University System of Maryland, USA. On graduation, she worked as Director of Assessment at the Bowie State University, Maryland USA from Oct. 2010 to April 2011.